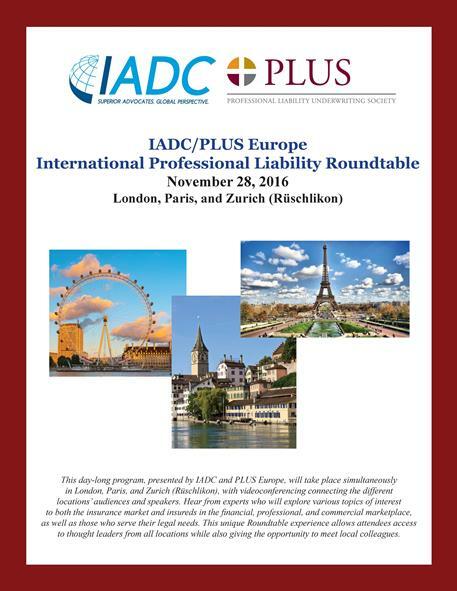 Thank you to everyone who participated in the International Professional Liability Roundtable, a day-long program presented by IADC and PLUS EUROPE. The program took place simultaneously in London, Paris, and Zurich (Rüschlikon), with videoconferencing connecting the different locations’ audiences and speakers. Thank you to event sponsors Hogan Lovells LLP and Swiss Re; to PLUS Europe for co-presenting; and to Tanguy Le Gouëllec De Schwarz who acted as program chair.